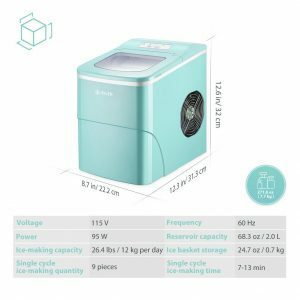 Green iSiLER Portable Ice Maker is a brand new number one release electric countertop model with fast ice making capability of a 95-watt power refrigerant (115Volts and 60Hz frequency) and a large storage capacity. It is designed to produce 9 large bullet shaped ice cubes every 7 to 13 minutes and has more than 26 lb. (12kg) ice making capacity per day, enough for 250 to 300 cold drinks. It has a large 68.3 oz or 2-liter reservoir, and you’ll get a removable 1.5-pound (0.7 kg) ice storage bin and an ABS ice scoop in the package. 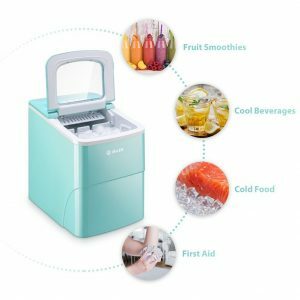 iSILER Ice Maker will start working and making ice as soon as you fill the water tank and press the power (On/Off) button. You can select from two sizes of hollow bullet-shaped ice, small or large by the simple press of a button for your different needs. The shape of the ice means bigger surface and will certainly cool your drinks faster. You do not have to open the lid as you’ll be able to see what’s going on through the transparent window. It is safe to operate with the built-in security features and will stop working when you need to add more water in or when the ice basket is full. It will let you make ice conveniently at home or in restaurants, cafes, bars, sandwich bars etc. Green iSILER Ice Maker weighs 17 pounds and measures 8.7 x 12.3 x 12.6 inches. It is a compact ice maker that you can put on your kitchen bench or anywhere you want as it also comes with a 71 inch (1.8m) long power cord. You can use the ice it produces for your cold drinks and food and for first aid purposes. The appropriate water feed temp range is specified as 46.4 to 89.6 degrees Fahrenheit and the suitable temperature as 50 to 109 degrees Fahrenheit. It will not make ice quickly when the ambient temperature or the added water temperature is high and the ice will melt quicker than normal too. Please note that you don’t connect this unit to a water source and includes a water reservoir. It will make ice when there is no more water in the tank or the 1.5 lb. capacity ice bin is full. You’ll get a two-year warranty by the distributor as well as a 3-month returns policy if you’re not happy with the product. *On the same product page you also have the option to get dessert or ice maker at a very affordable price. The dessert maker will crush the frozen fruits and the ice cream maker will stir and freeze the ice cream ingredients for different ice cream flavors.